Monitors the tire pressure while you are driving. If your vehicle's tire pressure becomes significantly low, the low tire pressure/TPMS indicator comes on and a message appears on the multi-information display. 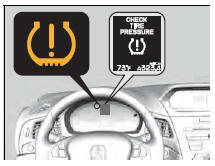 CHECK TIRE PRESSURE is displayed when a tire has significantly low pressure. Conditions such as low ambient temperature and altitude change directly affect tire pressure and can trigger the low tire pressure/TPMS indicator to come on. Tire pressure checked and inflated in: • Warm weather can become under-inflated in colder weather. • Cold weather can become over-inflated in warmer weather. The low tire pressure/TPMS indicator will not come on as a result of over inflation.